Mar y Sierra, Argentina’s vacation coast, is the 30-mile stretch along the Atlantic between San Clemente del Tuyo and Mar del Palata. Here, tranquil beaches and often placid seas are interspersed among towering cliffs and rocky shores that are continuously beaten by crashing waves. Argentina’s summer playground extends from the Atlantic coast inland, covering an area of 569 square miles of shoreline, rolling hills and pastures, lakes and lagoons. This is the General Puerrydón district of the province of Buenos Aires. Its capital is Mar del Plata, “La Perla del Atlántico” (The Pearl of the Atlantic), 250 miles south of Buenos Aires. Prior to its development, sea lions (lobos marinos) inhabited much of the Atlantic coastal waters, especially the beaches south of Mar del Plata, which today are among the most exclusive of the region. The zone was known as La Lobería and there are even references, dating as far back as 1885, to carriage rides from the Hotel Bristol to look at the sea lions. Unfortunately, the sea lions attracted hunters as well as nature watchers and their numbers began to decline quite rapidly. Nowadays, sea lions are protected. Visitors can again observe them in their “natural environment” at the Reserva Natural Barranca de los Lobos or catch their show at the Mar del Plata Aquarium. 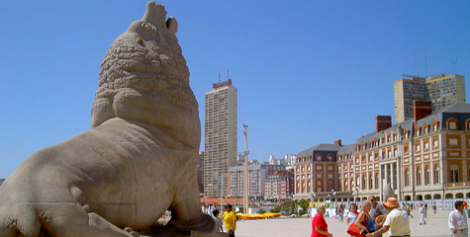 Yet sea lions and beaches aren’t the only draw for the four million visitors who flock to Mar del Plata from Buenos Aires and cities and towns throughout Argentina every summer (remember, it’s December through March in the southern hemisphere) and on weekends too. You can watch the fishing boats set off for a day’s work as the sun rises over the Atlantic, and then spend the rest of the day playing golf or tennis; fishing off one of the jetties along the shore or at a nearby lake; horseback riding in the Parque Camet; biking along the shoreline, stopping at beaches whenever the mood strikes you; or hiking in the surrounding countryside. Not surprisingly, windsurfing, kayaking, swimming, and, of course, sunbathing are also widely practiced. If all that sounds like too much work for a vacation, never fear. Mar del Plata has a very strong creative community and offers much in the way of culture. You’ll find museums, art galleries, exhibit halls and artisan fairs throughout the city, along with concerts and great theater during the summer. Afternoon tea is de rigueur here (dinner is not until 11 pm) and a great way to catch up on the latest trends. You can people-watch from an outdoor table on the pedestrian-only Avenida San Martín while sharing a plate of alfajores marplatenses (local pastries). Plus, after this late afternoon break you’ll feel refreshed and ready for a night on the town. You can gamble the night away at Mar del Plata’s renowned Casino Provincial, take in a show, dance until dawn at the city’s many discos, or spend a quiet evening at a pub or confitería.